Tonight while surfing through amazon I stumbled upon Sandra Boynton. Remembering how fond my children were of her board books when they were toddlers, I read a few of the reviews. 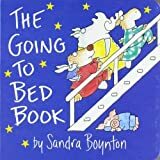 I laughed and cried thinking about how frequently “The Going To Bed Book” was read in our household and how IMPORTANT it became in our bedtime ritual. Out of curiosity I pulled the old book from our library shelves and went to my kids, now 15, 12 and 9 and began to recite a few lines. *NOTE – I didn’t actually NEED the book in order to do this. To my delight each of them perked up, smiled and began to chant the lines right along with me. They remembered the characters, the words, the way we used to read the story. You see, for them the memories of this book are wonderful as well! Sandra Boynton is gifted at coupling wonderful, readable verse with delightful illustration. Don’t miss this book and don’t hesitiate to purchase others from her collection. We have HUNDREDS of read aloud childrens books in this house. This ranks right up there with the absolute favorites and should be IMHO amongst the first books read to a cherished babe. P.S. Don’t miss “Doggies” either! If you read this one with FEELING they’ll be begging for it time and again! Sandra Boynton’s colorful board book is a bedtime treat! An assortment of expressive animals gets ready for bed aboard a giant boat. Boynton amusingly shows then bathing, dressing, brushing teeth (“With some on top and some beneath, they brush and brush and brush their teeth.”), and exercising together. It closes with the animals settling down for the night: “They rock and rock and rock to sleep.” Graced by Boynton’s well-known illustrations and rhythmic, lullabye-like poetry, this is a great book for infants and toddlers alike. It’s one of those books you’ll keep long after the kid(s) grow up.